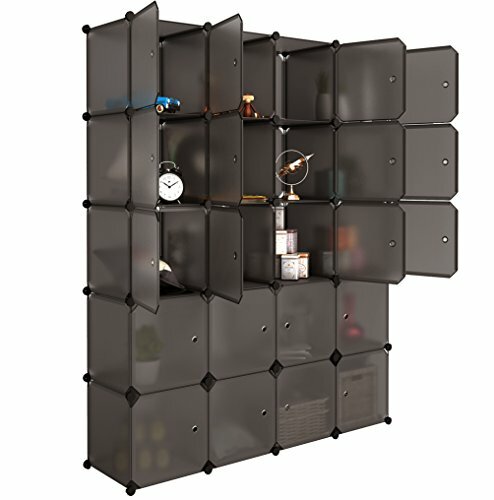 This multifunctional 20-cubes stackable organizing closet is perfect for a modern home. The unit is totally customizable. You can choose to put all the cubes together to create a large closet for your clothes, bedding and lining, or separate the cubes into a couple of smaller shelving units to use as side table with storage space. Perfect solution for rooms with a smaller surface or as temporary spare closet. Thanks to its transparent brown color, it will easily match most décor rooms. Ideal for any living room, bedroom, or small space, like a crowded university dorm room. This shelving unit provides ample space to store clothes, toys, blankets, shoes, school suppliers and other small items to keep them tidy and organize. It can also be used as a room divider and to display photo frames and other decorative objects. Finally, you can choose to put the door panels or not, to create a close or open storage organizer. In order to put together his unit, you will not need any tool. Connect the panels and door panels with the plastic connectors (included). To keep the unit in good shape, clean it with a damp cloth. Please note that each panel might slightly bend when loaded but it's a normal phenomenon (do not put more than 10 lbs./cube). Kindly keep an eye on children when near the unit. DURABLE MATERIALS: the cubes use steel frames to keep the structure solid and stable, each plastic cube holds up to 10 lbs.